Editor William Jones presents eighteen tales of lurking evil and "terrifying realities" in Horrors Beyond. Jones couldn't have chosen a better opening story for his anthology than Tim Curran's "The Eyes of Howard Curlix": With a reverential nod to H.P. Lovecraft's "From Beyond," Curran writes of a doomed physicist who, like Crawford Tillinghast and his "accursed electrical machine," succeeds in breaking down the barriers between dimensions. Heavy with an atmosphere of dread, Curran's homage is a masterpiece in its own right. Later, Brian M. Sammons pays tribute to Frank Belknap Long with "One Way Conversation," in which the Hounds of Tindalos are alerted to our presence by tachyon transmissions. Sammons uses foreboding to dramatic effect: Tension mounts throughout the tale as messages sent back from the future warn of imminent danger. Readers may notice a subtle shift in the collection as the "horrors" evolve: No longer content to live among us, forces from beyond hunger to live within us in stories like Ann K. Schwader's "Experiencing the Other." And in William Mitchell's "His Wonders in the Deep," formless entities possess the bodies of shipwreck survivors through the conduit of sheer terror. Mitchell's elegant prose sustains a Lovecraftian mood while also evoking scenes from "The Exorcist." At the anthology's midpoint, the "horrors" mutate yet again, and it becomes apparent that we share much in common with the "monsters." Mankind creates a new foe for itself via genetic tinkering in Tony Campbell's action-packed "After the War," and genetically-engineered humans are "bred" for their work in William Jones' contribution, "The Name of the Enemy." Jones' story is the final brush stroke blurring the line between "us" and "them": While troops under alien siege wait for reinforcements, their commander mingles "crawler" DNA with his own as part of a plan to reawaken fear within the invaders. Horrors Beyond boasts an impressive diversity of tone, from Ron Shiflet's tongue-in-cheek "The Prototype," a story as campy as the movies it mentions, to Cody Goodfellow's somber - and challenging - "Cahokia," in which man is revealed as Plague incarnate. Although Jones does his best to assemble the sometimes disparate pieces into a cohesive collection, there are square pegs that don't quite fit, such as Richard A. Lupoff's "Dingbats." And when C.J. Henderson describes a vapid population enthralled by music software in "Vuuduu," his vision seems more Orwellian than Lovecraftian. 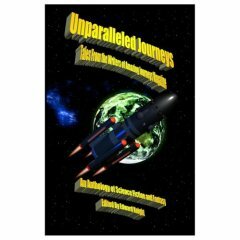 Readers searching for an anthology of clearly demarcated horror or science fiction stories should look elsewhere: Jones' goal was to show that a collection built around the theme of "unknown horrors" could easily span multiple genres because of how Lovecraft has "infiltrated our writing." David Conyers' pulse-pounding "False Containment" - a heady mix of science fiction, horror, and thriller - is a fantastic example of the kind of hybridization featured in the book. It's incredibly appropriate that an anthology devoted to the breaking of dimensional barriers would proceed to break through conventional genre boundaries, as well. Fans of dark "fusion fiction" can follow William Jones once more unto the breach in October 2007, when Elder Signs Press releases "Horrors Beyond 2."